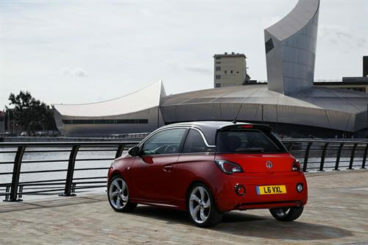 Looking for an objective review of the new Vauxhall Adam Hatchback? OSV has got you covered, from engines to lease deals. When the Vauxhall Adam was first launched, cynics sneered that the best thing about it is that it might share your first name. However, they’ve been proved wrong, as this is a funky fresh small car that’s been a massive hit – and not just with Adam’s! The Adam is Vauxhall’s response to the Fiat 500 and the MINI Hatchback. It’s just as stylish as its rivals, which means you get to potter around the town while looking fabulous. It’s small enough to be able to nip through gaps in the morning traffic, and can be personalised until you get it look and feel the way you want it to. 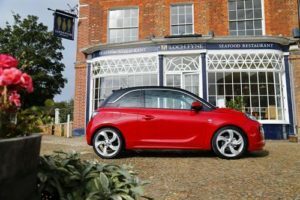 OSV takes a closer look at what it’s all about with our 2017 Vauxhall Adam Hatchback review. The Adam looks a bit bolder and more assertive than its rivals thanks to large wheels that seem disproportionate to its overall size. These large wheels perform a function too, and offer the car plenty of grip. However, the steering is a bit unresponsive, which means that the synergy between wheels and steering that you’ll find in the Ford Fiesta is missing here. And that’s a real shame. On the plus side, there is a S version which will suit young, keen drivers. Brake parts and the suspension setup are taken from the rapid Vauxhall Corsa VXR, and the dull handling of the standard Adam is sharpened up. The suspension on the standard car is a little bit too firm for our liking, and it doesn’t do a good job at absorbing lumps and bumps. Fit the car with bigger alloys, and you’ll certainly feel it when you crash over a pothole. Still, this car was designed for the city, and it is in the city where it feels right at home. It’s agile and sprightly, and its compact dimensions enable it to easily manoeuvre tighter turns. There are no diesel engines in the range, which means your choice is limited to a bunch of petrol engines. 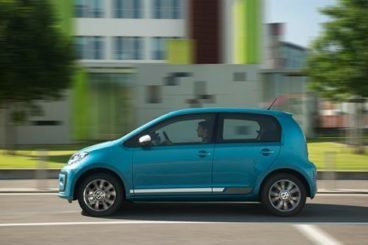 The 1.2-litre unit sits at the bottom of the range, and it’s going to feel too lethargic for most buyers who want their cute city car to have a spring in its step. It takes ages to wake up, and gets you from a rest to 62mph in 15.0 seconds. It’ll also do a fair bit of grumbling on the way. The 1.4-litre 86bhp engine is not much better, though it does the 0-62 sprint in 12.5 seconds, which is reasonable. A 99bhp version is a better bet, though, and it cuts a whole second off that 0-62 time. The highlight of the range is undoubtedly a 1.0-litre three pot turbocharged unit, though. It delivers up to 113bhp, and can get you from a standstill to 62mph in less than 10.0 seconds. It’s powerful, and it’s also quiet. Perfect for those Monday mornings when the last thing you want to hear is a hoarse engine that just won’t shut up! The Vauxhall Adam’s cabin is a classy affair, and one which can more than hold its own when compared to rivals. There are plenty of personalisation options available, which means that you can kit the interior out with the colours that you want. As mentioned, though, the ride quality is a weakness, so you will have to put up with a firm ride. It’s easy to get comfortable, thanks to a reach and height adjustable leather steering wheel. We like the colourful and attractive dash inserts, while the materials used are the best yet in a compact Vauxhall. The air vents are embellished by chromed rings, and the dials are nice and clear. However, the standard stereo looks old hat and out of place. The Adam is perfect for commuters, but it’s less than ideal when it comes time to do your shopping. It has just three doors, and a 170-litre boot makes it easily one of the least practical cars n this class. The slender boot opening and high load lip don’t help matters at all. You can fold the rear seats down to improve space to 663. On the outside, a sloping roofline might look good, but it does limit rear headroom. It also restricts visibility. However, leg and knee room is good up front. There are a number of handy storage spaces dotted in and around the cabin, including door pockets that can cope with bottle of water, as well as two cup holders for you and your passenger. Standard equipment is good across the range, with the base level model getting air conditioning, alloys, Bluetooth phone connection, cruise control and a CD player. The Glam model gets climate control, more chrome, a DAB digital radio and a glass roof. The Slam trim adds 17” alloys, more colours and sports suspension, while the Energised model benefits from LED daytime running lights and lashings of black – a black roof, black alloys and more black exterior touches. The Adam S is the sporty version and comes with 18” alloys, better brakes, a different body kit and tinted windows. The car scored 4 out of 5 for safety in its Euro NCAP crash tests, but rivals such as the Fiat 500 got a perfect score. Failing to adequately protect against whiplash in the event of a rear impact was one of the things it was marked down for, while standard safety kit includes hill hold assistance and 6 airbags. Prices for the new car start out from just over £12,000 and rise to £19,000. If you prefer to lease, you can pick up a deal from as little as . For more information on our lease deals, you can check out our page here. In terms of running costs, the Adam fares reasonably well, but there are cheaper rivals. There are no engines in this range that can achieve fuel economy better than 60mpg, which puts the car at a huge disadvantage if costs are a top priority of yours. The cheapest engine in the Adam’s range is also its smallest – the dinky 1.0-litre unit that can achieve average fuel economy returns of 60.1mpg if you stick to the smaller wheels. The car looks fab, and is funky inside and out. The engines are all perky enough, but the str of the show is a turbocharged 1.0-litre three pot that can get you from rest to 62mph in less than 10 seconds. It’s also the cheapest to run. You can customise the car as much as you want, and can choose from a number of different paint finishes, different wheels and different graphics. It really will feel like home. Space up front is fine, but it’s a very different story in the cramped rear. Scratch that – the 170-litre boot is tiny! Vauxhall Adam Hatchback vs Vauxhall Corsa Hatchback vs Volkswagen Up! Let’s see how the car looks compared to its rivals in the comparison section of our Vauxhall Adam Hatchback review. The new Vauxhall Corsa Hatchback offers excellent value for money, and is a much more practical and affordable offering than previously. 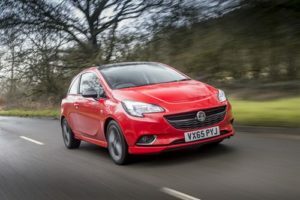 Last time around, the Corsa wasn’t the most entertaining of small hatchback’s to drive, but Vauxhall recognised the problems and have shorn things up. As a result, the Corsa can now boast better body control and improved ride quality. The suspension has also been stiffened, which has resulted in a sharper driving experience. However, the Fiesta is still the car for both the Adam and Corsa to beat when it comes to drivability. A brand spanking new 1.0-litre 113bhp turbo petrol engine has refreshed the line-up, adding some much-needed power and gusto. It’s a lively little number which can get you from a standstill to 62mph in 10.3 seconds, and it’s cheap to run and very refined. It’s our top pick. Other engines for your consideration include a 1.4-litre turbo petrol engine that can deliver almost 100bhp. Despite that extra power, it takes almost a second longer to cover the 0-62mph stretch. It’s also a fairly noisy affair. 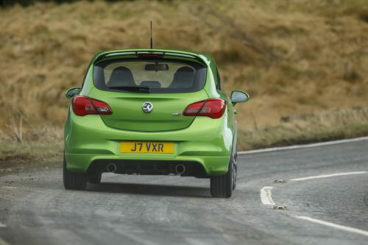 The Corsa was pretty expensive last time around, but Vauxhall have cut £2,500 from the price tag. Running costs are more attractive too, with a 1.3-litre CDTi diesel engine able to achieve eye-catching fuel economy returns of 83.1mpg while costing nothing in road tax. The petrols are inexpensive to keep on the road too, with the 1.0-litre turbo able to average returns of 64.2mpg in its least powerful guise. The Corsa’s interior is another much-improved area. The only criticism we have are cheap-feeling seats. Apart from that, you get a clean-looking dashboard that comes fitted with the brand’s widely-praised IntelliLink 7” touchscreen, a choice of colours for each trim, as well as plenty of soft-touch plastics. The Corsa is available as either a three door or five door model. As expected, the latter is more practical, and is easier to access. Moreover, the three-door’s rear headroom is compromised by a sloping roofline. That said, both models are the same size and (more or less) shape as each other, as well as the outgoing model. This means three people can still sit in comfort in the back, and Vauxhall have been able to make sure there are enough storage spaces to help you keep the place clean and tidy. The boot measures 285-litres, which makes it considerably more useful than the one in the Adam. The brand new Volkswagen Up! is VW’s cutest car. It’s so cute, you just wish you could pinch its cheeks. The Up! has a lot going for it, especially a keen sense of fun on the road. For commuters who wish they could nip through traffic with ease and look stylish in the city, the colourful Up! has a lot going for it. We’ll start with its driving dynamics. 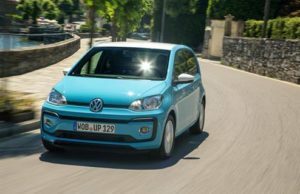 Few cars in any sector feel as at home in the city as the new Volkswagen Up! Hatchback. Its tight turning circle and precise steering means it can pop through gaps in the traffic like a Super Mario Kart. The engines make a fair noise, but it’s a characterful hum that rarely becomes annoying. On bright summer days, you might even find yourself humming along. In terms of the engines, a 1.0-litre petrol unit is available with either 59 or 79bhp, but our favourite is the turbocharged 89bhp version which has only just recently dropped. It feels funky fresh, and has enough power to get you from rest to 62 in less than 10 seconds. The 74bhp, meanwhile, is a bit of a slow coach and takes 13 seconds to cover that sprint. It’s a good choice if you’re going to be spending practically all of your time in the town or city, though. One of the best things about the Up! is its affordability. Keeping any engine on the road doesn’t cost much at all, with average returns of 64.2mpg from a petrol engine nothing to be sneezed at. These fuel economy returns can be managed by both the 59 and 79bhp versions of the 1.0-litre petrol engine, and they both cost just £20 a yea in road tax. Fit the engines with BlueMotion tech, and you can squeeze even more fuel consumption out of the car – up to 68.9mpg. 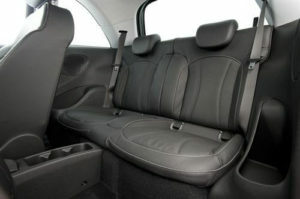 The VW Up!’s interior is comfy and classy. Fit and finish is almost on par with the more upmarket models in Volkswagen’s stables, while there are plenty of chances for you to customise the cabin. On the whole, the interior is a colourful, bright affair that makes you feel good to sit inside. The dash manages to look youthful and vibrant, and the steering wheel is height adjustable. The Up! is not the biggest car around, but VW have packaged it well. It’s strictly a four seater, but all four adults should be super comfortable. Space up front is particularly good, with a drawback for rear seated passengers being the low roof, which will limit headroom. The car is available as either a three or five door, and both come with a 251-litre boot. The Adam is more expensive than Vauxhall’s super cheap and basic Viva. As such, it’s got more style, and a bit more oomph. However, this city car’s selling points don’t really go far beyond its looks and its personalisation options. The boot is small, the rear seats are cramped, and running costs are not excellent. Still, the Vauxhall Adam Hatchback can nip through traffic just as well as any other city car, it offers a good turn of pace and, yes, it looks great. Fill out the form below with your details, including whether you’re looking to lease or buy and we’ll give you a quote within 24 hours. By ticking this box you are agreeing that OSV Ltd can process and store the data that you have entered in this form - as well as any other information provided during our sales processes. Would you like to receive e-mail marketing? By ticking yes you are agreeing to receive e-mail marketing from OSV Ltd. This includes content such as our special offers, latest video reviews and articles. ARE YOU INTERESTED IN GETTING A City Car?